Thanks for checking this sub-State out. This sub-State is prepared on the a-political concept that if you are interested in 'place' in Australia, the most important aspect that defines 'place', is the 'flow of water'. The Senate is interested in 'place'. This sub-State defines its boundaries at the top of the ridge, where water flows one way rather than the other. This leads to a very interesting 'place'. We are seeking a debate with people who live in this proposed new sub-State. We know we've got the sub-State pretty well correct; after all, it's just geography. But if you live in this sub-State you can tell us a lot of interesting things. - Upon formation, what should be the name of this sub-State? Who would be the Chief Officer? Who would be the Senator who represents this sub-State? We think that this is a great new concept of Statehood based on real concepts that define life in this particular sub-State. What do you think? The CSIRO has regions for projecting the impact of Climate Change. See https://www.climatechangeinaustralia.gov.au/en/climate-projections/futur... 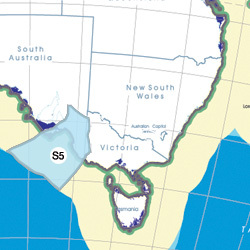 This sub-state, Murray-Darling Basin Foreshore Sub-State (S5), is one of the clear projections in a CSIRO cluster called "Murray Basin region". CSIRO's Murray Basin region coincides with BloggerMe's S2,S3,S4,S5. "Already, mussels have disappeared from many streams in eastern Australia from loss of catchment vegetation in association with agricultural development. The habitats in many streams have become degraded from channel erosion and sedimentation. Increased nutrient loads in runoff, loss of shading vegetation and invasive water plants like Salvinia molesta and water hyacinth (Eichhornia spp.) have badly affected mussels in some parts of Australia. "Efforts have been made to bring the plight of the freshwater mussel to the attention of conservation bodies. Species such as the Glenelg River Mussel (Hyridella glenelgensis) have been recently listed as “Critically Endangered” under the Victorian Flora and Fauna Guarantee Act 1988 and the Commonwealth Environment Protection and Biodiversity Conservation Act 1999 (EPBC Act)." Kathy Bowrey from UNSW analysed the Hindmarsh Island controversy in terms of IP and cultural heritage.